I am Jeff Thompson and have been working on and off with MilkyWay@home since 2012, but I have been quiet recently. For the next few months, on Tuesdays, we will be scheduling server maintenance. We will post on the day threads for any issues that may arise. This is a heads up. The current task limit of 80 tasks means that my HD 7970 for instance will run out of work in about 90 minutes or so without contact with the server. If the outages are going to be extended, it might be advisable to raise the task limit so that work can continue during the outages. Thanks for your work on this valuable project! Is this why this Started? During maintenance it is really needed to increasde WU ! Now, I also understand limitation of 80 WU/hot or GPU to prevent some "ghosts" to take a lot of WU who will never be crunched. But also o prevent server overload. Till now, the deadline is about 12 days. For the next two days it is challenge on FormulaBoinc. I see on server status no any problem. On friday 31 august 16:15 UTC, there are about 400,000 WU "in progresse. Considering 80WU / host (CPU and or GPU), it seem to be about max 5,000 hosts. So why not to increase WU limitation ? Installed on a new machine but no workunits have downloaded. Is this part of the database management? I reinstalled BOINC and still no work units downloaded. Any Ideas? All other machines are processing normally. Stalls at "Waiting to contact project servers"
Please follow up on my post concerning a new install. Running Windows 7 32bit. 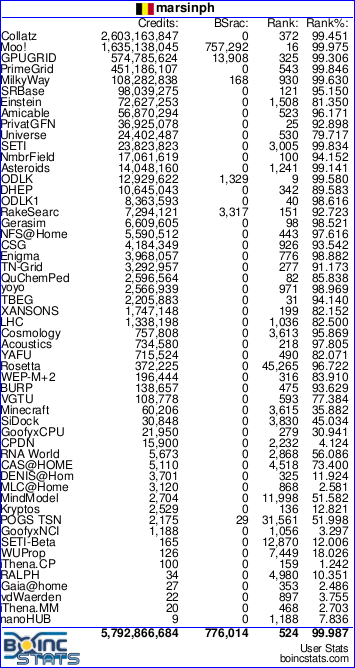 Boinc starts but stalls. I have reinstalled and still no joy. I have other computers running just fine. Message 67811 - Posted: 11 Sep 2018, 11:19:32 UTC - in response to Message 67810. People have seen your post but it's an Admin thing to help you at this point, we are users too and have no control over the project. Have you tried detaching and reattaching? Are you sure there's a 32 bit app here? All your other pc's are 64 bit. When I look at your pc's the 32 bit one doesn't have any gpu drivers in it, are you trying to do cpu workunits?